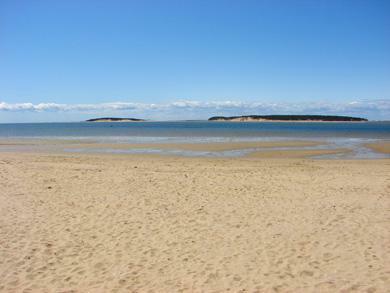 Just past Wellfleet harbor on Kendrick Avenue is Mayo Beach, perfect for families with children. The water is calm and warm and the beach is bordered by beach grass. The view is beautiful, with a rock jetty, boats heading in and out of the harbor, and the distant dunes of Great Island providing a relaxing scene. Right across the street is a terrific playground, so if the kids get restless and bored with the beach you can take them over to Baker's Field for some swinging, climbing, and sliding. Parking is free if you can get a space in the small lot. If not, a large town parking lot is close by at the town pier. Restrooms are located at Baker's Field, an easy stroll across the street from Mayo Beach. Food can be found within close walking distance at any of several restaurants located in the harbor area.